Visited by Henning Høholt, tekst og fotos. I anledning markeringen av Martin Luther, som på denne dagen 31.10.1517 hengte opp sine 95 teser på Kirkedøren i Wittenberg, publiserer vi på nytt denne historien fra vårt besøk i Wittenberg, en by som absolut er et besøk værd. WITTENBERG/GERMANY: Startpunktet for reformasjonen oppgis tradisjonelt som 31. oktober 1517, den dag han utsendte sine diskusjonsteser mot sider ved avlatspraksisen, som han ifølge en mye omtalt, men noe svakt historisk belagt hendelse spikret opp på kirkedøren i Wittenberg. Men i seg selv representerte ikke denne hendelsen noe skjellsettende brudd. Derimot var det den måten striden mellom Luther og hans motstandere utviklet seg på, både dens stadig eskalerende form og i dens gravitasjon mot teologisk mer sentrale anliggender enn kun sider ved kirkelig botspraksis, som frembragte et ugjenkallelig brudd i løpet av få år. 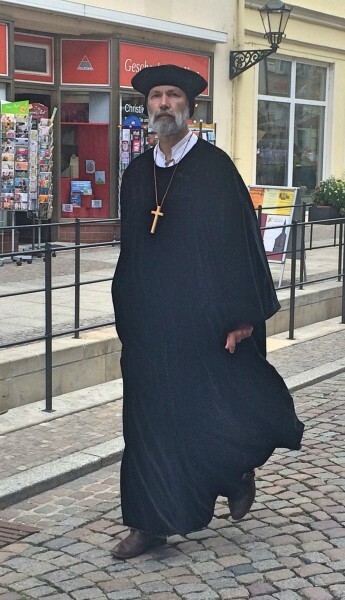 I Grünes Gelobe i Dresden, tett på Martin Luther romnet, fant vi to interessante historiske objekter som har interessant kontakt til denne historie. we found two interesting historical objects, who has connection to this matter. 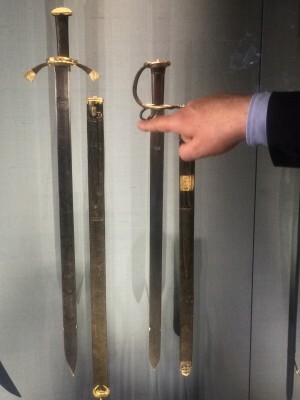 First the hat of erkebiskopen av Magdeburg og Mainz, Albrecht av Brandenburg, then the sword that Martin Luther had, – to protect him self. Erkebiskopen av Magdeburg og Mainz, Albrecht av Brandenburg, Den befinner seg i Dresden i Grünes Gelobe. Foto Henning Høholt. 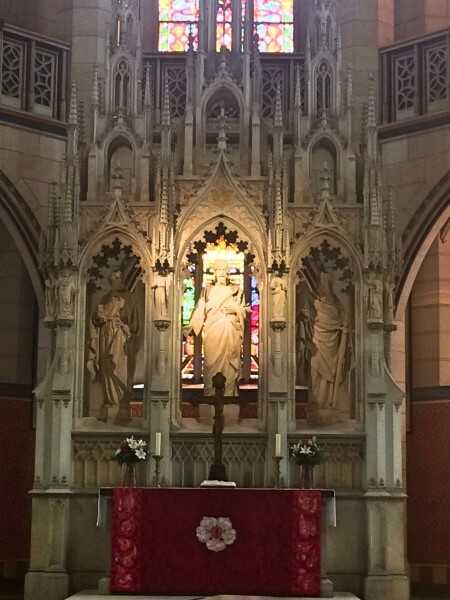 Alter All saints Church, Wittenberg. Please note the Martin Luther rose at the alter cloth. One of the summer hits in Wittenberg, Germany is the Middle Age market, which was arranged 9.-11th June, in the beautiful city of Wittenberg, Germany, where the hit is the parade Saturday at 14.00 called Martin Luthers Wedding, where thousand of participants in middle age costumes are making a longa parade through the beautiful city center, inclusive participants, suppose to play the roles as Martin Luther and his wife Katarina von Bora. The authorities in the city tells that 100.000 visitors was expected to be present at this market day, and the small city streets were packed. 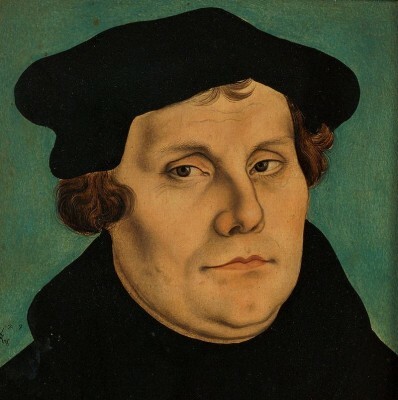 Martin Luther, German; 10 November 1483 – 18 February 1546), O.S.A., was a German professor of theology, composer, priest, monk, and a seminal figure in the Protestant Reformation. – Cranach painting from 1529. Many beautiful and time right costumes were presented, it was in deed a bi´g event, and a success, and the weather was first class, warm sunshine. 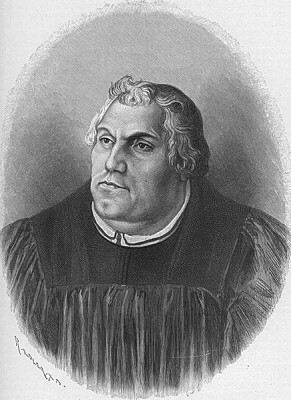 The importance of Wittenberg historically was due to its seat of the Elector of Saxony, a dignity held by the dukes of Saxe-Wittenberg and also to its close connection with Martin Luther and the dawn of the Protestant Reformation; several of its buildings are associated with the events of this time. Part of the Augustinianmonastery in which Luther dwelt, first as a monk and later as owner with his wife and family, is preserved and considered to be the world’s premier museum dedicated to Luther. Various Luther and Melanchthon memorial sites were added to the UNESCO world heritage list in 1996. Stadtkirche on the Market Square. Wittenberg. Wittenberg is home to numerous historical sites, as well as portraits and other paintings by Lucas Cranach the Elder and Younger. On the doors of All Saints’ Church, the Schlosskirche (“castle church”, built in 1496–1506) Luther is said to have nailed his 95 theses in 1517. It was seriously damaged by fire in 1760 during a bombardment by the French during the Seven Years’ War, was practically rebuilt, and was later (1885–1892) restored. The wooden doors, burnt in 1760, were replaced in 1858 by bronze doors, bearing the Latin text of the theses. Inside the church are the tombs of Luther and Philipp Melanchthon, and of the electors Frederick the Wise (by Peter Vischer the Younger, 1527) and John the Constant (by Hans Vischer), and portraits of the reformers by Lucas Cranach the Younger. Main Square, Sculpture in front of the City Hall. St. Mary’s Church, the parish church in which Luther often preached, was built in the 14th century, but has been much altered since Luther’s time. It contains a painting by Lucas Cranach the Elder, representing the Last Supper (with the faces of Luther and other reformers), Baptism and Confession, also a font by Hermann Vischer the Elder (1457). In addition, there are numerous historic paintings in the church. The ancient electoral palace is another of the buildings that suffered severely in 1760; it now contains archives. Martin Luther’s home, the Lutherhaus, where he studied and lived both before and after the Reformation, is now a museum containing many artifacts from his life. Melanchthon’s house and the house of Lucas Cranach the Elder, mayor of Wittenberg, can also be found here. 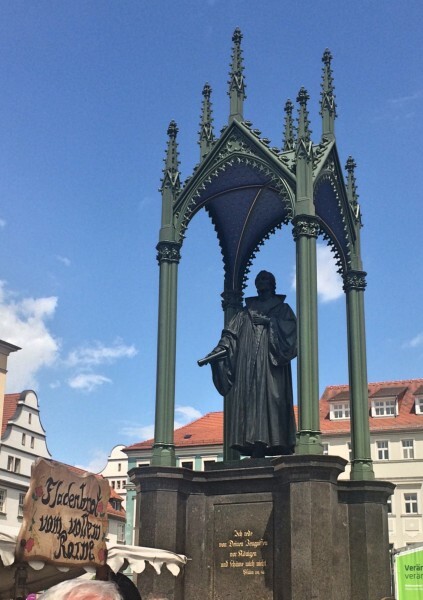 Statues of Luther (by Schadow), Melanchthon and Bugenhagen embellish the town. The spot outside the Elster Gate where Luther publicly burned the papal bull in 1520 is marked by an oak tree. 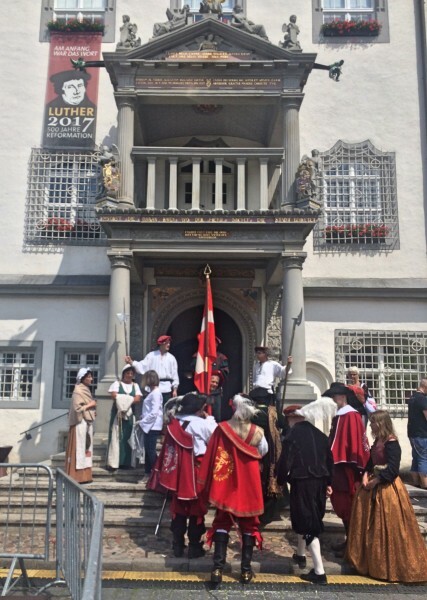 Danish delegation from Haderslev entering City Hall Lutherstadt Wittenberg during the Market. 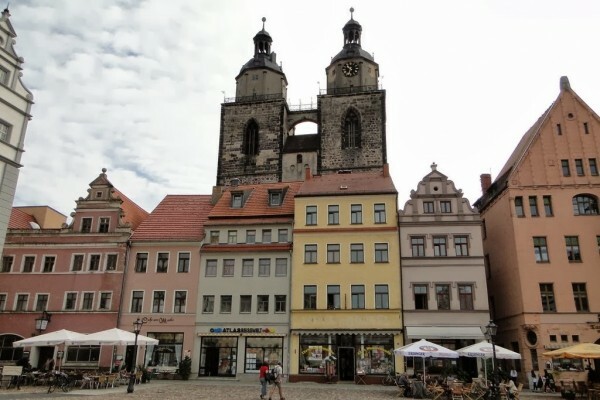 We enjoyed very much Lutherstadt Wittenberg, and look forward to the next possibility to visit.